Corn Vada is a kid friendly evening snack that is addictive. 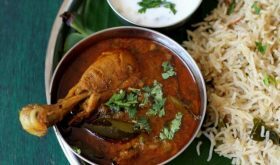 Its impossible to go wrong with this Andhra style recipe that has Bengal gram as a binding agent along with fresh coriander, onions, green chilis and ginger. Its versatile and adaptable to variations. You can add greens like spinach and methi (fenugreek leaves). Or add peanuts for the crunch factor. 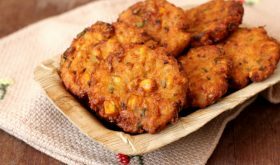 Its advisable to use Indian corn that is slightly mature as the tender corn will not work well for preparing the Vadas. Grind the corn kernels (1 cup) and the soaked and drained chana dal, green chilies and ginger to a coarse paste adding about 1-2 tbsps of water. Remove to a bowl. Add 1/4 cup of boiled sweet corn, chopped onions, coriander leaves, cumin seeds and salt and mix well. Form lemon sized balls with the mixture. Flatten it on your palm to make a patti shape. Prepare patties with the rest of the mixture. Keep in fridge for 10 mts. Heat oil for deep frying. Once its hot, reduce flame to medium and slolwy place the patties in the oil and fry them on both sides to a golden brown color. Serve warm with tomato sauce or any chutney of your choice. You can add a tbsp of corn flour to the ground mixture. 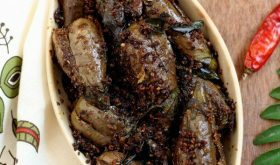 You can add fennel seeds instead of cumin seeds. Pudina aka mint leaves also add great flavor to the vada. Add 5-6 leaves. Do not use the tender variety of Indian corn. Use the slightly mature corn cobs. Peel the corn kernels and do not boil them. While grinding, do not make a smooth paste but it should be slightly coarse. If you do not have maize aka Indian corn on hand, use American sweet corn kernels. By Sailu Published: September 14, 2013 Corn Vada, an Andhra style recipe makes for a wonderful tea time snack. 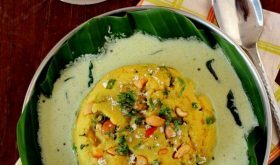 Easy to make with minimal ingredients among Indian corn recipes that are vegetarian. Rats! How could I possibly be fresh out of Indian corn, chana dal, and coriander leaves? Guess I can’t make it tonight! Very tempting Vadas Sailu !! yummy………..will try this soon. very yummy and perfect snack with tea.. Perfect sunday snack!! Will definitely make this..
looks great..one query though..do we deep fry or shallow fry? if u want to shallow fry boil the chenna and corn before grind them. 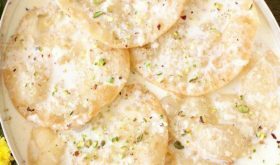 Can this recipe be tried with american sweet corn kernels? 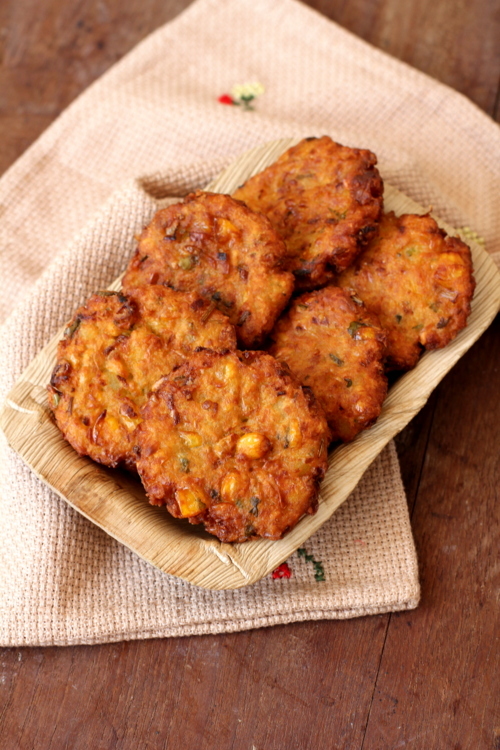 My Favorite Corn Vada, Always have plesure to eat this…. 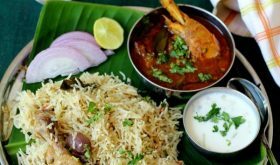 It’s Very Yummy…..